It is an old dish from Bengal. 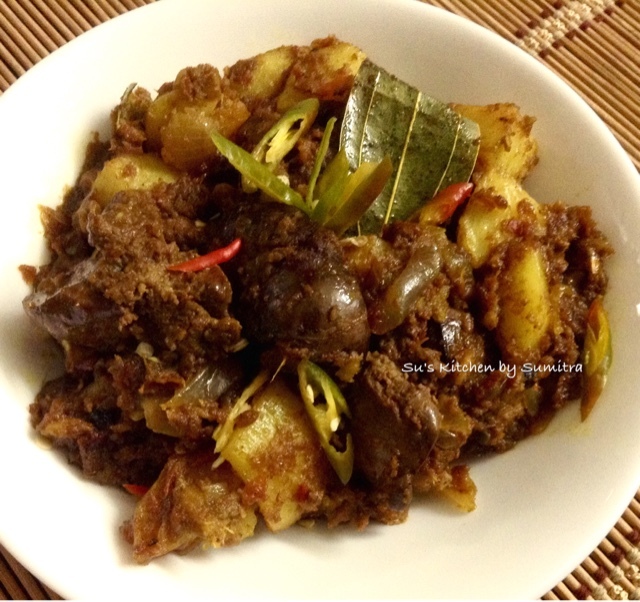 It is basically made with Mutton Liver, but you can use Chicken Liver too. Here I have made it with Chicken liver. This can be servered as a side dish and can be eaten with Paratha and Roti or Rice. Marinate the liver with 1/4 tsp turmeric powder and salt for 30 minutes. Add oil in a wok. Heat it till smoking hot. Reduce the flame. Add the potatoes and fry it till light golden in colour. Remove it and keep it aside. In the same oil, add the cloves, cardamom, cinnamon and pepper corns. Sauté it for 2 minutes. 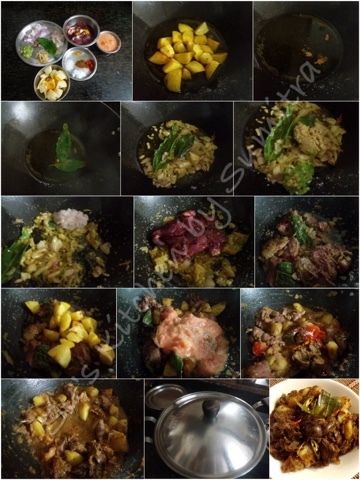 Add the bay leaf and the chopped onions. Sauté it till light brown in colour. Add the ginger garlic and chilli paste. Sauté it for 2 minutes. Add the onion paste. Sauté it for 2 minutes. Add the liver pieces. Stir and cook for 5 minutes. Add the potatoes. Continue to stir and cook for 3 minutes more. Add the tomato puree and stir. Add the powder spices, salt and sugar. Stir and let it simmer for 2 minutes. Add 1/2 cup water. Cover and cook till the water dries up. Garnish with chopped chillies. Serve it hot.